Despite concerted efforts by the European Commission, Roma inclusion is still far from being a reality. A new strategy is needed. 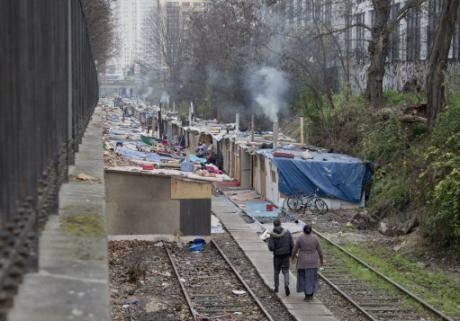 Roma community in a makeshift camp on the outskirts of Paris, France. PAimages/Jacques Brinon. All rights reserved. Three months ago, Mitko Yonkov, a 17-year-old Roma from the Bulgarian village of Ovchepoltsi was violently beaten by a 24-year-old non Roma man. The ‘reason’ for the attack? Mitko told his assailant that they were both equal, despite their different ethnicities. The attacker recorded the beating and posted it on social media. It is a distressing example of how deeply rooted and widely tolerated anti-Gypsyism is across Europe. The European Commission launched the EU Framework for National Roma Integration Strategies (NRIS) in 2011 with the goal to address discrimination and reduce the gap between Roma and non Roma in access to employment, education, housing and healthcare by 2020. Halfway through the EU Framework, Roma inclusion is still far from being a reality. If we look at education, segregation of Roma in education is high and growing. The Roma Inclusion Index has measured that between 2005 and 2015 in Slovakia, segregation of Roma children in schools for the mentally disabled has increased from 31% to 51%. In Serbia, the amount of Roma placed in schools for mentally disabled is 36 times the rate of non-Roma in comparison to 2005. These figures clearly indicate that the EU Framework for Roma Integration is failing to reach its objectives. First, the current National Roma Integration Strategies does not adequately respond to anti-Gypsyism, which takes the form of anti-Roma prejudices and racist state practices. The data from the 2015 Roma Inclusion Index show that 64% of Roma have experienced discrimination in the Czech Republic and Hungary. To tackle discrimination against Roma in education, the European Commission used the EU anti-discrimination legislation and launched three infringement procedures against the Czech Republic, Slovakia and Hungary. However, the unlawful practice of sending Romani children to schools for mentally disabled children when they are not continues. And a number of member states such as Italy, France, Bulgaria and Romania continue to use forced evictions and segregated Roma housing. It is essential that the European Commission persists in and extends its actions against member states that violate EU anti-discrimination law. But legislation, even with robust enforcement, will not be sufficient to address this deeply rooted racism in institutions and society, especially in the light of growing intolerance towards Roma. A 2014 study by the Pew Research Center showed that majority populations in a number of European countries have negative sentiments towards Roma with the striking numbers of 85% of Italians and 66% of French people. To address this effectively, the European Commission should put in place dedicated funding and specific policies, which work consistently to combat anti-Gypsyism as a specific form of racism in every policy area such as education, healthcare, housing and employment. The other major aspect for the failure of the EU Framework is the lack of any accountability and transparency on the progress made on policy implementation and funds spent on Roma inclusion by EU member states. Countries report to the European Commission on a yearly basis on their progress on Roma inclusion. The collected reports are published in a summary document – the EC Communication. But their full reports are not public, so no external actors can check what they have reported on. The process of preparation of this yearly document is closed to civil society organizations, who are also allowed to report on the progress but have no indication as to what information the European Commission will decide to use. Since 2011, substantial amounts have been allocated and spent by the European Commission and national governments on Roma policies, but no results have been seen on the ground. According to the newly published report of the European Court of Auditors, despite €1.5 billion EU funds having been earmarked for integrating marginalized communities, such as the Roma, between 2014 and 2020, it is not clear how this amount has impacted Roma communities. The court mentioned that lack of data on ethnicity makes it difficult to assess Roma inclusion projects funds by the EU. The solution is to reform the current EU Framework for National Roma Integration Strategies. This means that in the strategy of each member state, funding, policies and legislation should be used in consistency to combat anti-Gypsyism effectively in every policy area such as education, healthcare, housing and employment. In order to monitor the impact of integration policies, accountability and transparency mechanisms for member states should be put in place and implemented. Data disaggregated by ethnicity should be collected to show whether policies and funding are making a difference in Roma people’s lives. The court reports that Roma account for between 15 to 20% of school pupils and new labor market entrants in Romania, Bulgaria, Slovakia and Hungary. If the EU and national governments turn a blind eye to effective Roma inclusion, 6 million EU citizens will be lost to European societies and markets. The European project cannot afford to leave them behind. Even worse, young Roma like Mitko will continue to be subjected to violent hate crime for daring to claim their equality.